Inkfish: Is Bo Obama a Fraud? A hypoallergenic dog, we're told, is one that politely keeps its dander to itself and makes the air safer for allergy sufferers to breathe. Yet a new study claims to have debunked the whole notion of the allergy-friendly dog. Is this fair? Researchers from the Henry Ford Health System in Detroit studied a group of 173 homes that had both a baby and exactly one dog. After surveying each dog's owners about its breed, size, and how much time the dog spent indoors, the researchers collected a sample of dust from the floor of the baby's bedroom. They then measured the amount of dog allergen in each sample (the main allergy-causing ingredient in dog dander is a molecule called Can f 1). The families' dogs came from 60 different breeds. Researchers divided these dogs into hypoallergenic and non-hypoallergenic groups and looked for a difference in the amount of allergen the dogs left on their floors. Since "hypoallergenic" is not a label that's been defined scientifically--the problem that drove this study in the first place--the researchers tried several different methods to group the dogs. In their looser groupings, they put any dog that turned up in an internet search for allergy-free animals into the hypoallergenic category. They tried including, or not including, mutts with one supposedly hypoallergenic parent. In the strictest grouping, they considered only purebreds defined by the American Kennel Club as hypoallergenic, and compared them to all other dogs. So have we all been lied to? Is this dog, famously invited into the First Family because it wouldn't trouble little Malia's allergies, part of a large-scale deception? The headlines would have you believe so: There's No Such Thing as Hypoallergenic Dogs, they say. Hypoallergenic Dogs Are Just a Myth. Don't Waste Your Money. The authors of the study say it's unclear how the idea of the hypoallergenic dog originated, though it was in the late 20th century that the concept became popular. In a previous study, researchers shaved hair off of dogs of several breeds and measured the allergen present. Those authors found that although there was significant variation between breeds, there was also plenty of variation between individual dogs. And they found that poodles, dogs commonly called hypoallergenic, had a high level of allergen on their fur compared to other breeds. Christine Johnson and her co-authors wanted a more meaningful measurement of how much allergen was in the atmosphere of dog-owning homes, so they collected dust from the floors rather than fur from the dogs themselves. However, neither study measured the amount of allergen in the air, where it's actually inhaled by allergy sufferers. Allergen that's settled on the floor might be a good approximation of what was previously in the air--except that Can f 1, the allergen being measured, has two major sources: the fur and the saliva. Dogs that are heavy droolers, or ardent crumb seekers, could be depositing allergens all over the floor without necessarily impacting how much is in the air. "Hypo-" means "less," not "none." The American Kennel Club says that dogs producing less dander "generally do well with people with allergies," and recommends 11 breeds to try. But this study didn't have a large enough sample size to look at individual breeds; it could only compare groups of dogs. So while the study didn't find an obvious difference between supposedly hypoallergenic dogs--as a group--and other dogs, the study did not show that there's no such thing as a hypoallergenic dog. If you're looking for a dog that doesn't trigger your allergies, you'd be better off spending some time around the dog itself than relying on an internet categorization. The variation between individual dogs' dander production might be more important than their breeds, anyway. Whether or not some breeds are truly hypoallergenic, science owes it to the allergy-ridden to create useful tests and meaningful labels for dogs. No one should have to live in fear of Bo. 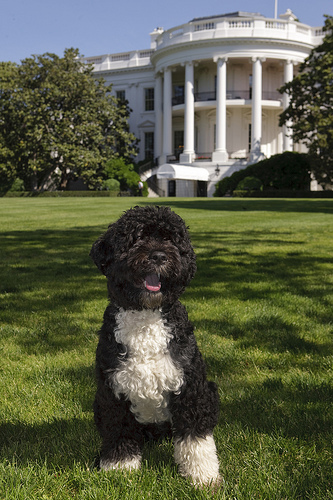 Bo: Official White House photo by Chuck Kennedy.